If you have any questions about the AXIOMA information page below please contact us. This motor yacht AXIOMA is a superyacht of large proportions. 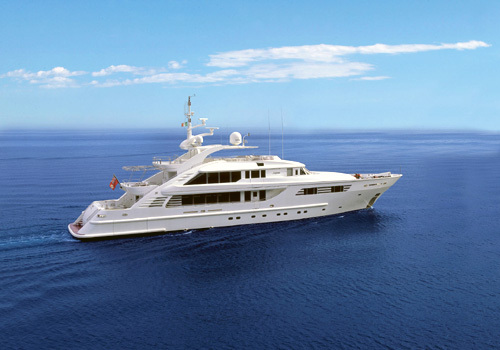 This 48 metre (155 foot) luxury yacht was made by by Isa (International Shipyards Ancona) in 2006. 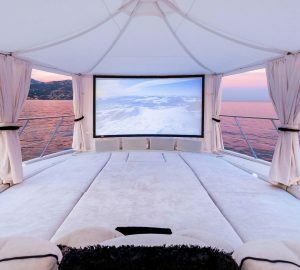 Superyacht AXIOMA is a beautiful yacht that is able to sleep as many as 12 guests on board and has around 9 crew. The naval architecture office who actualised this yacht's design for the yacht was Walter Franchini and Isa Yachts. Luca Dini Design was also responsible for the overall interior design. The yacht's wider design collaboration came from Walter Franchini and Isa Yachts. The professional naval architect plans are the creation of Walter Franchini. Motor Yacht AXIOMA received her elegant interior designing from the interior design company of Luca Dini Design. In 2006 she was formally launched to celebration in Ancona and following sea trials and detailing was afterwards delivered to the yacht owner. Isa (International Shipyards Ancona) completed their new build motor yacht in Italy. Her hull was constructed with steel. The motor yacht superstructure is made for the most part from aluminium. With a beam of 8.9 metres or 28.2 ft AXIOMA has fairly large interior. A reasonably shallow draught of 2.74m (9ft) affects the amount of harbours she can visit, contingent on their particular depth at low tide. The motor yacht is powered by twin ample MTU diesel engine(s) and can reach a impressive maximum limit speed underway of approximately 17 knots. The engine of the ship gives 2365 horse power (or 1740 kilowatts). Her total HP is 4730 HP and her total Kilowatts are 3481. AXIOMA is propelled by twin screw propellers (fixed pitch). With respect to the ship’s stabalisers she uses Rodriquez Marine Systems. Her efficacious cruise speed is 14 knots which makes a range of 4750. Bestowing room for a limit of 12 visiting passengers sleeping aboard, the AXIOMA accommodates them comfortably. This ship has room for circa 9 capable crew members to operate. In Sept 2009 AXIOMA sailed to San Remo, in Italy. AXIOMA also cruised the cruising ground encompassing Provincia di Imperia during Sept 2009. She has a teak deck. The luxury yacht AXIOMA displayed on this page is merely informational and she is not necessarily available for yacht charter or for sale, nor is she represented or marketed in anyway by CharterWorld. This web page and the superyacht information contained herein is not contractual. All yacht specifications and informations are displayed in good faith but CharterWorld does not warrant or assume any legal liability or responsibility for the current accuracy, completeness, validity, or usefulness of any superyacht information and/or images displayed. All boat information is subject to change without prior notice and may not be current.